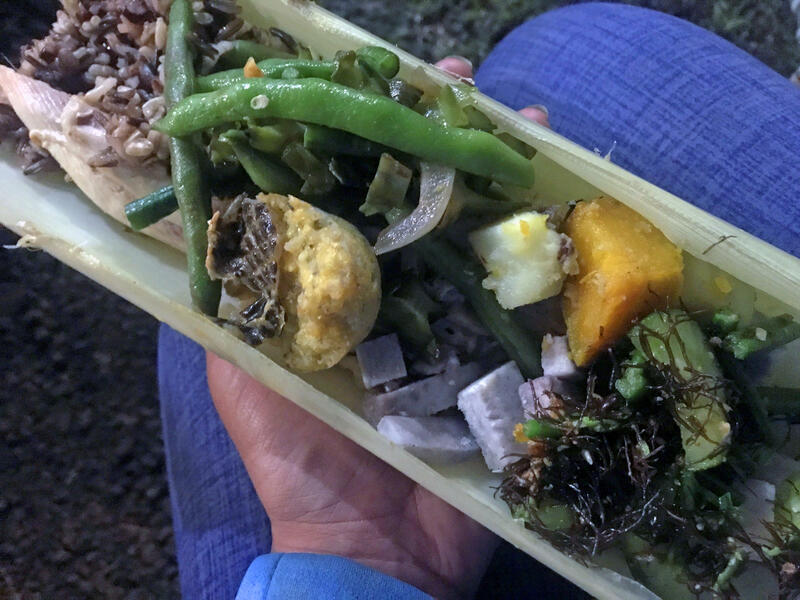 The feast at a recent Decolonizing Our Diets Dinner at Ho'oulu 'Aina in Kalihi. The dinner is hosted by the ROOTS Program and featured food from 18 small farm partners from around the island. We are less than a day away from Thanksgiving, and if you’re a conscious consumer, you’re preparing that mindful holiday meal. Is it all locally-sourced? Did you meticulously calculate portions to eliminate waste? Perhaps you went vegan? In Hawai‘i, an increased awareness of our food choices is also giving way to a raised consciousness about this American holiday and what it means. HPR’s Kuʻuwehi Hiraishi has this story. Dinner plates are prepared for the several dozen attendees of the recent Decolonizing Our Diets Dinner. That’s Kaʻiulani Odom explaining the spread for tonight’s Decolonizing Our Diets Dinner at Hoʻoulu ʻĀina in Kalihi. 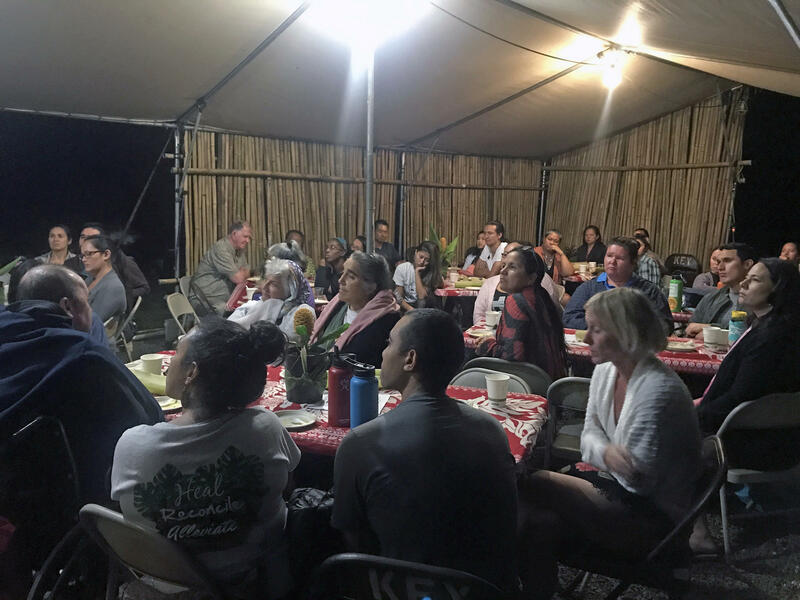 Odom runs the ongoing dinner series as part of Kōkua Kalihi Valley's ROOTS Program. Laiana Kanoa-Wong (standing) shares the history of national holidays established during the Hawaiian Kingdom. Kanoa-Wong shared the history of national holidays celebrated during the Hawaiian Kingdom like Lā Kūʻokoʻa or Hawaiian Independence Day, which falls on November 28, and is often overshadowed by the American Thanksgiving. This was the day in 1843 when England and France formally recognized the Hawaiian Kingdom’s sovereignty. Audience members engage in discussions about decolonization with regards to Thanksgiving. Discussions went even further back into Hawaiian history to a time when this chilly fall weather meant Makahiki season – a four month celebration in honor of the god Lono, when food, games and festivities were enjoyed to commemorate a successful harvest. Liana Honda of Hamākua tries to incorporate this idea of Makahiki into Thanksgiving dinners with her family. 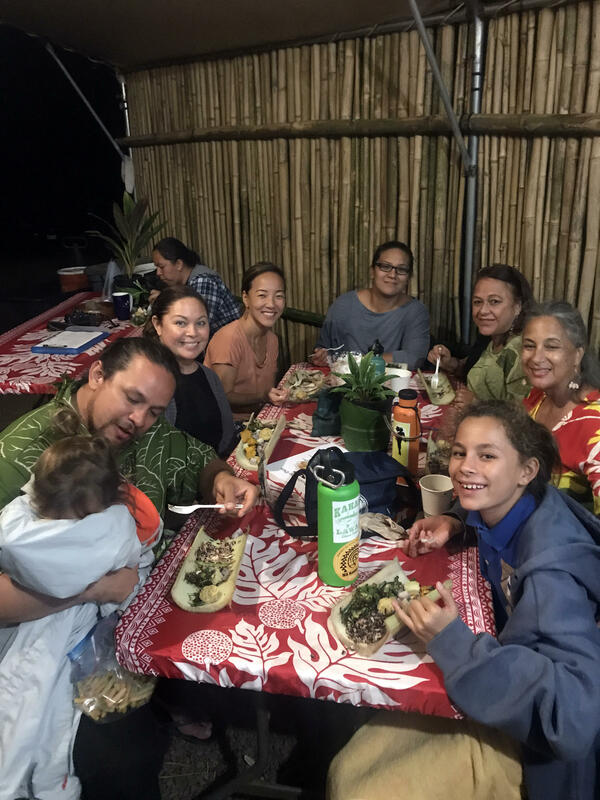 Kanoa-Wong (bottom left) battles his youngest child to pose for a picture with the rest of his family and friends at the Decolonizing Our Diets Dinner. Discussions continued as participant after participant recalled some history of struggling with their colonial past – the loss of language, displacement, cultural assimilation – and their shared solidarity in a more indigenous future. This Thanksgiving, some families will be getting a side of politics alongside their turkey and mashed potatoes. That’s because this year’s holiday comes on the heels of a particularly divisive election. HPR’s Molly Solomon got some tips from a professional on how to best manage divided feelings at the dinner table. When it comes to Thanksgiving traditions, nothing is more local than a turkey served up imu-style. Last night hundreds of birds were placed in underground ovens, called imus. They steam overnight on hot lava rocks, covered with layers of banana leaf. And as HPR’s Molly Solomon reports, the results are delicious! The traditional Thanksgiving dinner holds a different meaning here in the islands. Turkey baked in an imu could share table space with a plate of kalbi short ribs. And as families across the state get ready for the holiday, we checked in with local residents to hear what a Hawai‘i Thanksgiving means to them. Kōkua Kalihi Valley is a family service center that grew out of the community’s need. Since its modest beginnings in 1972, KKV has grown to serve over 10 thousand people every year, and its staff is fluent in over 20 Asian and Pacific languages and dialects. HPR’s Noe Tanigawa found a focus on community runs through the work at KKV.